A monster burger for your monster appetite! Ground beef patties stuffed with a Cheddar Bacon Stuffing and served with all the trimmings. 1. In a medium pot with a splash of water, cook bacon over medium heat for 8 to 10 minutes, or until crispy. 2. Remove bacon from the pot and pour off bacon fat until 1 cup of bacon fat remains. 3. Add onions and garlic to the pot with the bacon fat; stir and cook over medium heat for 6 to 8 minutes, until onions are soft. 4. Stir vinegar into the pot, scraping cooked-on bits of bacon off the bottom. 5. Continue cooking and stirring over medium heat for 8 to 12 minutes, until liquid volume reduces by about eighty percent. 6. Add the sugar, maple syrup, coffee, chipotle pepper, and half of the bourbon. 7. Reduce heat to low and simmer for 5 to 10 minutes, until mixture thickens to a syrup consistency. 8. Add remaining bourbon and stir in 2/3 of the bacon, to finish; reserve the remaining bacon for the Bacon and Cheddar Filling. 9. Remove jam from heat and refrigerate in a bowl or jar until assembly. 1. Combine Cheddar and reserved bacon to make the filling; set mixture aside until assembly. 2. Divide ground beef into 10 (3.5-ounce) balls. Place each ball between two (4x4-inch) pieces of wax paper. 3. Using the bottom of a plate, press patties until ground beef reaches the edges of the paper. 4. Remove one side of the wax paper from two patties; top one patty with Cheddar and Bacon stuffing. 5. Flip the second patty onto the first so that the wax paper is on the outside each patty. 6. Press patties together and pinch around the edges to seal; repeat with remaining burger patties to form 5 stuffed burgers. 7. Remove wax paper and cook burgers on the grill for 5 to 7 minutes per side, until burgers reach an internal temperature of at least 160ºF and juices run clear. 8. Toast burger buns on the grill while burgers cook. 9. In a medium pan, cook bacon for 8 to 10 minutes, until crisp. 10. 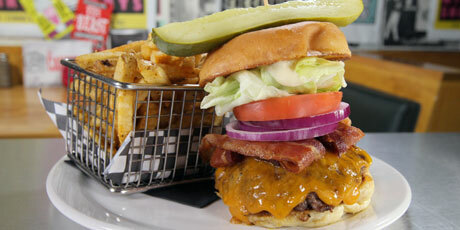 Top burger patties with Cheddar cheese and four strips of crispy bacon. Spread Maple Bourbon Bacon Jam onto the bottom halves of the toasted buns; spread mayonnaise onto the top halves. 11. Add lettuce, tomato, and red onion to the top halves of the buns. Place stuffed burgers onto the bottom halves and close burgers to finish. Maple Bourbon Bacon Jam will keep for up to a week if covered and refrigerated.